Use this comprehensive glossary to define terms commonly used in the alternative fuels and advanced vehicles industry. If you have questions about specific technologies or fuels, contact the Technical Response Service at 1-800-254-6735. A vehicle that combines new engine, power, or drivetrain systems to significantly improve fuel economy. This includes hybrid power systems and fuel cells, as well as some specialized electric vehicles. After the exhaust gas of the engine is filtered through the diesel particulate filter (DPF) and the diesel oxidation catalyst to reduce particulate matter, diesel exhaust fluid (DEF) is injected into the exhaust gas mixture and is reduced to nitrogen and water by chemical conversion within the selective catalytic reducer (SCR) before being released into the atmosphere via the vehicle's tailpipe. A dedicated, flexible fuel, or dual-fuel vehicle designed to operate on at least one alternative fuel. Anaerobic digestion is series of processes in which microorganisms break down biodegradable material in the absence of oxygen. A nonprofit organization that develops and delivers international standards. ASTM standards, test methods, specifications, and procedures are recognized as definitive guidelines for fuel quality. The lowest temperature at which a flammable gas vapor will ignite spontaneously, without a source of ignition, after several minutes of exposure to sources of heat. The battery provides electricity to start the engine and power vehicle electronics/accessories. In an electric drive vehicle, the auxiliary battery provides electricity to power vehicle accessories. In an electric drive vehicle, the auxiliary battery provides electricity to start the car before the traction battery is engaged and also powers vehicle accessories. This battery stores energy generated from regenerative braking and provides supplemental power to the electric traction motor. Chemical reactions in living organisms. Using enzymes and catalysts to change biological substances chemically to produce energy products. An example is digestion of organic wastes or sewage by microorganisms to produce methane. Plant matter such as trees, grasses, agricultural residue, algae, and other biological material. A fuel dispenser that draws fuel from two separate storage tanks and can dispense preprogrammed blends of those two fuels. Cetane number relates to the fuels susceptibility to self-ignite. The higher the cetane number, the greater the fuel's tendency to self-ignite. The charge port allows the vehicle to connect to an external power supply in order to charge the traction battery pack. Amendments to the Clean Air Act of 1970 creating two gasoline standards to reduce vehicle emissions in highly polluted cities by requiring gasoline to contain cleaner-burning additives, such as ethanol. This device converts higher-voltage DC power from the traction battery pack to the lower-voltage DC power needed to run vehicle accessories and recharge the auxiliary battery. This port is for filling the diesel exhaust fluid tank. This tank holds diesel exhaust fluid, which is injected into the exhaust stream during selective catalytic reduction. This device uses a chemical process to break down pollutants in the exhaust stream, converting them into less harmful components. This device removes diesel particulate matter or soot from the exhaust gases of a diesel engine. A high-level gasoline-ethanol blend containing 51% to 83% ethanol, depending on geography and season. Generates electricity from the rotating wheels while braking, transferring that energy back to the traction battery pack. Some vehicles use motor generators that perform both the drive and regeneration functions. An interconnected system that maintains an instantaneous balance between supply and demand (generation and load) while moving electricity from generation source to customer. Electric current used as a power source. Electricity can be produced from a variety of feedstocks, including oil, coal, nuclear, hydro, natural gas, wind, and solar. Using power from the traction battery pack, this motor drives the vehicle's wheels. Some vehicles use motor generators that perform both the drive and regeneration functions. Using power from the fuel cell and the traction battery pack, this motor drives the vehicle's wheels. Some vehicles use motor generators that perform both the drive and regeneration functions. Electrolysis is a method by which an electric current splits water into hydrogen and oxygen. If the electricity used is from renewable sources, such as solar or wind, the resulting hydrogen will be considered renewable as well. The ECM controls the fuel mixture, ignition timing, and emissions system; monitors the operation of the vehicle; safeguards the engine from abuse; and detects and troubleshoots problems. The ECM controls the gasoline mixture, ignition timing, and emissions system; monitors the operation of the vehicle; safeguards the engine from abuse; and detects and troubleshoots problems. In a bi-fuel natural gas configuration, the natural gas ECM communicates with the gasoline ECM and controls the natural gas mixture, ignition timing, and emissions system; monitors the operation of the vehicle; safeguards the engine from abuse; and detects and troubleshoots problems. In a bi-fuel propane configuration, the propane ECM communicates with the gasoline ECM and controls the propane mixture, ignition timing, and emissions system; monitors the operation of the vehicle; safeguards the engine from abuse; and detects and troubleshoots problems. Equipment used in diesel-powered vehicles to reduce exhaust emissions, such as particulate matter and nitrogen oxides. New engines and vehicles can be designed with these technologies, and used engines can be retrofitted to use this equipment. Passed by Congress to enhance U.S. energy security by requiring federal, state, and alternative fuel provider fleets to implement petroleum-reduction measures. Learn more about EPAct Transportation Regulatory Activities. The exhaust system channels the exhaust gases from the engine out through the tailpipe. Any material converted to another form of fuel or energy product. An example is using cornstarch to produce ethanol. The minimum temperature at which a liquid gives off vapor within a test vessel in sufficient concentration to form an ignitable mixture with air near the surface of the liquid. The float assembly monitors the fuel level in a tank. A chemical used in fuel to reduce friction and increase performance. Ford has established a rigorous qualification program for advanced fuel vehicle modifiers. These guidelines are intended to provide guidance, modification recommendations, and engine operating specifications required to ensure customer satisfaction and reliability in line with Ford Motor Company standards. On-site assessments at each QVM location assure conformance to a high standard of manufacturing, assembly, workmanship, and customer service. An assembly of individual membrane electrodes that use hydrogen and oxygen to produce electricity. This is a filler or "nozzle" used to add fuel to the tank. This is a filler or "nozzle" used to add gasoline to the tank. A filler or "nozzle" is used to add natural gas to the tank. This is a filler or "nozzle" used to add propane to the tank. This filter traps dirt and other particles to prevent them from clogging critical fuel system components, such as fuel injectors. This system introduces fuel into the engine's combustion chambers for ignition. This system inserts gasoline into the engine's combustion chambers for ignition. This system inserts propane into the engine's combustion chambers for ignition. A metal tube or flexible hose (or a combination of these) allows for transferring fuel from the tank to the engine's fuel injection system. A metal tube or flexible hose (or a combination of these) allows for transferring gasoline from the tank to the engine's fuel injection system. A metal tube or flexible hose (or a combination of these) allows for transfering natural gas from the tank to the engine's fuel injection system. A metal tube or flexible hose (or a combination of these) allows for transferring propane from the tank to the engine's fuel injection system. A pump that transfers fuel from the tank to the engine's fuel injection system via the fuel line. On bi-fuel vehicles, this dashboard switch allows the driver to select between fuels. A fuel tank stores fuel on board the vehicle until it's needed to power the engine. Stores compressed natural gas on board the vehicle until it's needed by the engine. Stores fuel on board the vehicle until it's needed to power the engine. Stores fuel on board the vehicle to power the engine. This tank stores gasoline on board the vehicle until it's needed by the engine. Stores hydrogen gas on board the vehicle until it's needed by the fuel cell. Stores liquefied natural gas on board the vehicle until it's needed by the engine. This tank stores propane on board the vehicle until it's needed by the engine. The amount of fuel it takes to equal the energy content of one liquid gallon of gasoline where one gasoline gallon equivalent (GGE) equals 120,167 British thermal units (BTUs). The maximum weight of a vehicle, including curb weight (the weight of the vehicle on its own) and payload (the weight of cargo). The heating value is the amount of heat released during the combustion of a specific substance, usually a fuel or food. The higher heating value is determined by bringing all the products of combustion back to the original pre-combustion temperature, condensing any water vapor generated. This value assumes the entire water component is liquid in the products of combustion and that heat can be used. The ability to reduce friction—usually in fuel pumps and fuel injectors. Reduces and regulates the pressure of the fuel exiting the tank, lowering it to an acceptable level required by the engine 's fuel injection system. The additional price of an alternative fuel vehicle over a similar conventional vehicle. A conventional vehicle motor that burns fossil fuel in a chamber in the presence of air. In this configuration, fuel is injected into the combustion chamber and ignited by the high temperature achieved when a gas is greatly compressed. In this configuration, fuel is injected into either the intake manifold or the combustion chamber, where it is combined with air, and the air/fuel mix is ignited by the spark from a spark plug. Two or more compounds with the same formula but a different arrangement of atoms in the molecule and different properties. A measurement for electricity use. Legacy electric charging systems such as inductive paddles. Learn more about types of chargers. A large group or block (aggregate) of consumers joined together to leverage their combined purchasing power when negotiating rates for energy services. The heating value is the amount of heat released during the combustion of a specific substance, usually a fuel or food. The lower heating value is determined by subtracting the heat of vaporization of water from the higher heating value for a particular substance, treating any water as a vapor. Allows the vehicle operator or mechanic to manually shut off the fuel supply. Miles per gallon of gasoline equivalent (mpge) represents the number of miles a vehicle can travel using a quantity of fuel with the same energy content as a gallon of gasoline (33 kilowatt-hours). Traps dirt and other particles to prevent them from clogging critical fuel system components, such as fuel injectors. These monitor the pressure of the fuel supply and relay that information to the electronic control module. When producing a fuel takes more energy than the amount of energy the fuel provides. Takes the incoming AC electricity supplied via the charge port and converts it to DC power for charging the traction battery. It monitors battery characteristics such as voltage, current, temperature, and state of charge while charging the pack. This device shuts off the flow of fuel into a fuel tank after 80% capacity has been reached. A cleaner-burning additive in a fuel—usually containing hydrogen, carbon, and oxygen. Examples are ethers and alchohols, such as ethanol and methanol. Fuels blended with an additive—usually ether or ethanol—to increase oxygen content, allowing more-thorough combustion for reduced carbon monoxide emissions. Pmpg is the vehicle miles per gallon multiplied by the number of passengers traveling in the vehicle. 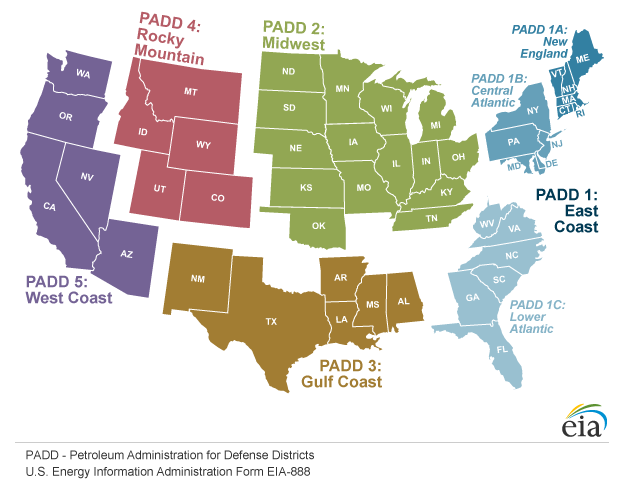 The Petroleum Administration for Defense Districts (PADD) are groupings of U.S. states and the District of Columbia. These districts are defined by the U.S. Energy Information Administration and used to report fuel prices. When producing a fuel takes less energy than the amount of energy the fuel provides. This unit manages the flow of electrical energy delivered by the traction battery, controlling the speed of the electric traction motor and the torque it produces. This unit manages the flow of electrical energy delivered by the fuel cell and the traction battery, controlling the speed of the electric traction motor and the torque it produces. This gauge measures and displays the fuel pressure within the tank. This device incorporates a valve to limit the pressure within the fuel tank. At a preset pressure level, the valve opens and fuel is vented from the tank. This number represents the ability of a fuel to resist knocking when ignited in the cylinder of an internal-combustion engine. The number here is the average of the research octane number and motor octane number. A feature of hybrid and plug-in electric vehicles that captures energy normally lost during braking by using the electric motor as a generator and storing the captured energy in the battery. A regulation created under the Energy Policy Act of 2005 and implemented by the U.S. Environmental Protection Agency to ensure transportation fuel sold in the United States contains a minimum volume of renewable fuel. Selective catalytic reduction (SCR) is a means of converting nitrogen oxides (NOx) into nitrogen (N2) and water (H20). This is done using a reductant, such as urea or ammonia, and a catalyst. Emissions produced through fuel combustion during a vehicle's operation. Animal fat that can be used to produce biodiesel. This primary, manual valve stops fuel from entering or leaving the tank. For assistance with technical questions about alternative fuels and advanced vehicles, email the Technical Response Service at technicalresponse@icf.com or call 1-800-254-6735. This system maintains a proper operating temperature range of the engine, electric motor, power electronics, and other components. This system maintains a proper operating temperature range of the fuel cell, electric motor, power electronics, and other components. Heat and pressure-based chemical reactions that produce energy. Through gasification (heating biomass by partial oxidation to produce synthesis gas) and pyrolysis (heating biomass in the absence of oxygen to produce liquid oil), biomass feedstocks can be converted to alcohol and hydrocarbon fuels, chemicals, and power. Stores electricity for use by the electric traction motor. In this process, the feedstock chemically reacts with an alcohol (usually methanol) in the presence of a catalyst, like lye. The products are glycerin and the biodiesel fuel or FAME (fatty acid methyl esters). The transmission transfers mechanical power from the engine and/or electric traction motor to drive the wheels. The transmission transfers mechanical power from the electric traction motor to drive the wheels. An energy-consuming sector that consists of all vehicles whose primary purpose is transporting people and/or goods from one physical location to another. Included are automobiles; trucks; buses; recreational vehicles; motorcycles; trains, subways, and other rail vehicles; aircraft; ships, barges, and other waterborne vehicles; and pipelines. Vehicles whose primary purpose is not transportation (e.g., construction cranes and bulldozers, farming vehicles, and warehouse tractors and forklifts) are not included. Vapor pressure is the pressure of the vapor resulting from evaporation of a fuel above a sample of the liquid in a closed container. It is used to measure volatility, an important property of transportation fuels. A system of classifying vehicles (e.g., passenger cars, commercial vehicles, trailers, off-road vehicles, and special-purpose vehicles). The size of vehicles. Includes light-duty, medium-duty, and heavy-duty vehicles based on their gross vehicle weight rating (the weight of a vehicle on its own plus the weight of cargo). Analysis of energy use and emissions from the primary energy source through vehicle operation. Second-hand cooking oil that can be used to produce biodiesel.